ANAND I-Power provides products for the replacement market under its proprietary I-Power brand. This brand is preferred by consumers in the commercial, three-wheeler, tractors and off-highway/construction equipment engines. The widest product range of piston rings on offer comprises almost every vehicle type and brand on Indian roads. I-Power is recognised as a ring technology expert with a rich understanding of customer needs. I-Power extended its breakthrough products like PVD and DLC rings to the large replacement market, receiving an overwhelming acceptance. At ANAND I-Power, our strong network of more than 500 distributors and 16 depots are spread across India. The I-Power brand has been established in the aftermarket, leveraging a strong bond with the entire trade channel (distributors, retailers and mechanics) through our proprietary digital/mobile platform. I-Power provides the widest product range of piston rings catering to almost every vehicle type and brand on Indian roads. 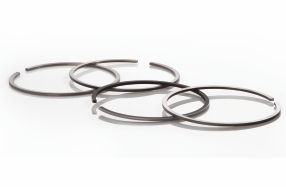 The company’s PVD and DLC rings received an overwhelming aftermarket acceptance. Protects side wear, while chrome ceramic ring is affected by side wear. Generates even radial wear around the periphery, while the chrome ceramic ring reports high uneven radial wear. Upper layer transferred to liner for perfect sealing. Middle functional layer for smooth running. Interface layer for PVD coating. Chrome coating for longer life.